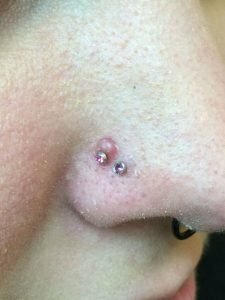 If you are thinking about a nostril piercing, you might have some questions such as how long it might take to heal, and whether certain things are normal. Here are some of the most common questions… and some answers! We say that any piercing can take six months to a year or longer to FULLY heal. This is because piercings tend to heal in peak and valley patterns where they will seem fully healed, then go back to being red, sore, and draining. We recommend that you leave your initial jewelry in for a minimum of two months and during that time, you can expect to see some clear to white-ish drainage, a little bit of swelling, and even some redness. These are normal signs of healing and as long as you use a vigilant aftercare routine of sea salt soaks and glycerin soap washes, these symptoms can go away fairly quickly. If after two months, you’re still experiencing some or all of the healing signs, then it is best to keep your jewelry in place and to continue using your aftercare until the redness goes away, the swelling is non-existent, and drainage is minimal. When can I change the initial jewelry? At Almost Famous Body Piercing, we recommend waiting at least two to six months before changing the nostril jewelry that you were pierced with. This is why it’s important to get a piece that you really love! We sell nostril jewelry in surgical steel and titanium, which are both great metal options for a healing piercing. It is particularly important not to remove the jewelry in the initial healing period, as that can damage fragile granulation tissue and significantly delay healing time. Is there a risk of infection with a nostril piercing? There is a risk of infection with any body piercing. When you get a body piercing, you are purposefully creating a wound in your body, putting a foreign object (the jewelry) in the wound, and expecting your body to heal around the jewelry. All your body systems will treat this wound you created as they would any other healing injury. Be sure to wash your hands thoroughly with soap and water before touching your new piercing for any reason. While your piercing is healing, it’s imperative that you avoid touching the area unless you are cleaning it and you will also want to stay away from products that can irritate your piercing such as alcohol, antibacterial soaps, ointments, and creams. Some people experience a healing bump at some point during the healing process. Healing bumps are commonly caused by not doing your aftercare on a regular basis for a long enough period of time. If you get a healing bump (they look similar to a pimple), start doing your aftercare again right away! This will help release the trapped drainage inside the bump. Don’t squeeze the bump. Leave it alone unless you are cleaning your piercing. It takes healing bumps several weeks to months to go away completely, so stick with your aftercare! Some people find it helpful to use a drop of tea tree oil on the area around the bump. If you have questions about healing bumps, call any of our locations and ask to speak to a piercer. Is it normal to have difficulty removing or changing the jewelry? Yes, it can be difficult, especially the first time you attempt to do a change out yourself. We do free change outs at the time of jewelry purchase, so once your piercing is healed, you can stop into any of our locations and we can help you choose a new piece of jewelry. Once you find one you love, one of our piercers will gladly put it in for you and can even give you instruction on how to change it yourself. We also have basic tools available for doing your own change outs, and our piercers are happy to show you how to use them. You can see the tools we have available for purchase. What should I do if I’m involved in contact or risk sports but can’t remove my piercing? What sort of initial jewelry should I get? At Almost Famous Body Piercing, we prefer to pierce nostrils with fishtail screws or captive bead rings. After your piercing is healed, we have many more styles to choose from such as labret studs , nose bones, L-bend jewelry , and ¾ hoop options that make adjustment easier. 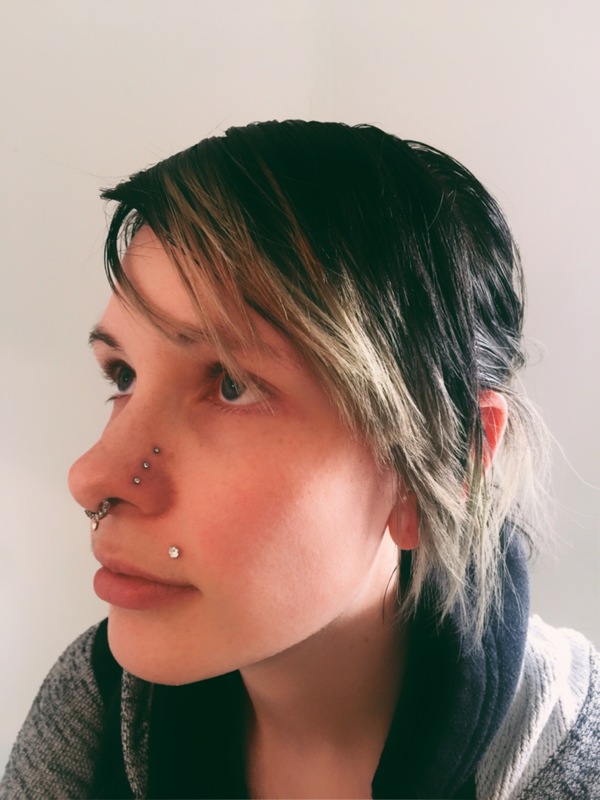 We do the initial piercing with nostril screws and captive rings because they tend to stay in the best and can be sized to fit each specific person. Red marks or streaks that radiate out from the piercing. Pain, swelling, and tenderness that gets worse over time. Significant yellow-green to bloody drainage, especially from the outside of the nose. Swollen or tender lymph glands. A fever not associated with cold/flu symptoms. If you are experiencing any of the symptoms above, we recommend that you to see a doctor. A bit of drainage is normal, as is some pain and tenderness that fades over time. Remember that a piercing is a wound and takes time to heal. Proper aftercare is essential to keeping the jewelry clean and the wound draining. If you have any questions about getting a body piercing or about a piercing that you already have, contact one of our locations and visit with one of our friendly piercing professionals. We have years of experience and would be more than happy to help you and give you any information you may need. What’s the Difference Between Surface and Dermal Piercings?